Albanian Prime Minister Sali Berisha names Iran and President Mahmoud Ahmadinejad "the new Nazis." Like most Muslim politicians, Albanian Prime Minister Sali Berisha is no shrinking violet. But despite the fact the nation he leads is a Muslim nation, Berisha made his commitment to the Jewish State crystal clear during his most recent visit to Israel, visiting the Western Wall and ignoring the Al Aqsa Mosque. 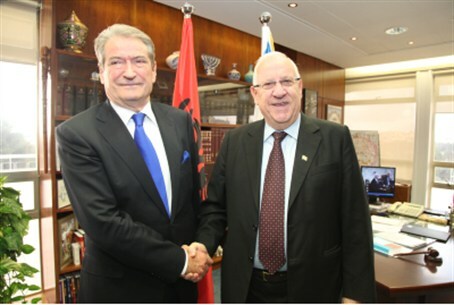 Albania, Berisha emphasized, is a "country of religious tolerance" and noted that Israelis have begun to spend their tourism cash there as an alternative to venues that are no longer as welcoming as they once were. Albania was strongly supportive of Israel during the recent session of the United Nations General Assembly, and did not support the bid by the Palestinian Authority for the Security Council to grant recognition of statehood and membership in the international body. In meetings with President Shimon Peres, Prime Minister Binyamin Netanyahu, Foreign Minister Avigdor Lieberman and Knesset Speaker Reuven Rivlin, Berisha reiterated his opinion that any unilateral action by the Palestinian Authority to establish an independent Arab country sans talks with Israel "sabotages the peace process." Berisha's visit, deemed a sterling success by Jerusalem sources, was capped by his telling Israel's largest Hebrew-language newspaper Yediot Acharonot that Iran and its President Mahmoud Ahmadinejad are "the new Nazis, and the world must learn from the Holocaust and stop them before it's too late. The Holocaust taught the free world's conscience not to let such a scenario repeat itself. Berisha vowed that his country, as a member of NATO, would join any military strike against the nuclear facilities in Iran, "just like we supported the operation in Libya." A nuclear Iran, he said, remains the "biggest threat to peace in the Middle East and in the entire world."